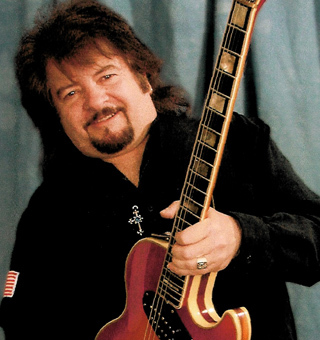 Vinny Martell, lead guitarist of Vanilla Fudge, and U.S. Navy Veteran, has received wide acclaim and worldwide recognition for the musicianship and originality that have etched out his place in the annals of rock history. His riff in the Vanilla Fudge chart topper, “You Keep Me Hangin’ On,” is ranked the number four heaviest guitar riff of all time by Guitar Magazine. Vanilla Fudge’s symphonic rock remake of this Supremes hit placed them at number six on the Billboard Charts in the U.S.A. and at number two on the charts in England, second only to The Beatles. Martell’s original, “Thoughts,” a B-side to “Take Me for a Little While,” went to number six on Italy’s Rock Charts. In the twenty-first century, Vinny has reunited with Vanilla Fudge and has toured the USA, playing to packed houses... His discography includes three solo CD’s, the latest a Tribute to Jimi Hendrix, as well as a new soon-to-be-released Vanilla Fudge tribute to Led Zeppelin. Watch for Vanilla Fudge and Vinny Martell Live-coming to get ya!!! !